I remember my first overnight backpacking trip so well: I was a student, 21-years old and the only thing that exceeded my testosterone levels was my enthusiasm to make sure everybody else had food-envy. Our mission was 4-days on the Fanie Botha trail. Armed with knowledge I gleaned from a few conversations, studying pictures of my parents doing a multi-day hike sometime in the 60s and a fair bit of imagination, I set myself to work on packing my 85-liter Karrimor Jaguar to the brim. Four sets of clean clothes, three jerseys, tracksuit pants, comfy running shoes (just in case my boots broke), an enormous hollow-fibre sleeping bag, a stove and gas canisters, copious amounts of food and sweet goodies went inside. A big aluminium kettle filled with more grub swung around on the outside next to some braai-tongs and a small axe. I did not bother to decant anything – the entire 200g bottle of Nescafe Classic went in. Three (or was it four?) bottles of red-wine claimed from my dad’s stash. A box of Pro-Nutro still in the box. And so on. My pack weighed a tonne. I was young and fit and smashing it 4-days a week at the Loftus gym, so the creaking shoulder straps would not be indicating a problem, right? I managed about 5km on the first day before I started dumping stuff – the coffee went first (I managed to decant some into an empty Simba-crisps packet); a bottle of wine last. And it was only when my forearms started resembling the colour of the sunset that I realised I did not pack sunscreen. Or toothpaste. Or a toothbrush. Well, at least I had a jar of pickles and a bottle of Mrs Balls chutney. 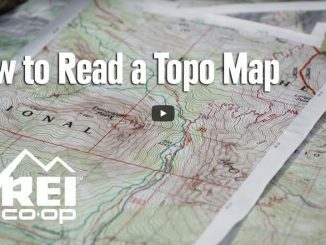 Over the years I have refined my packing, but every time I hike with an experienced hiker I still get a new idea, and every so often a new gadget comes to light, but the basics have been pretty much established. 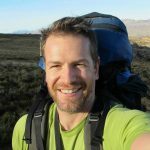 I will give an overview of what is best to pack for your hiking adventure, with some specific tips thrown in. 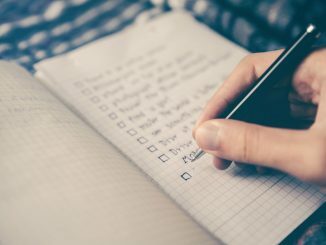 Please note that one can write an article on its own for every piece of equipment – and hence this should be used as introductory information at best. It is also advisable to get input from an experienced hiker before you venture into the wilderness. There’s a market for hiking-specific clothing and with good reason. Modern technology affords us the luxury of strong, lightweight and wicking materials. For the uninitiated, “wicking” here refers to the property of moving moisture away from the skin to the surface of the material, keeping it from clinging and makes it fast-drying. The trusty leather boot has been around for more than a century and is still the footwear-of-choice for many wanderers. Sturdy, lightweight materials; rubber technology, waterproof linings, synthetic insulation and carbon mid-soles have yielded a crop of highly technical and specialist footwear ranging from trail-running shoes to alpine boots. Feet are unique and different shoes work for different people – find the right ones for you. There’s a big move towards lightweight shoes made from synthetic materials, and often it is a good choice. But the lighter the shoe the less durable it will be, and in my experience a full-leather shoe/boot gives the best mix of reliability and comfort for doing multi-day hikes. Most shoe/foot problems take a day or two to show up, so test them properly. 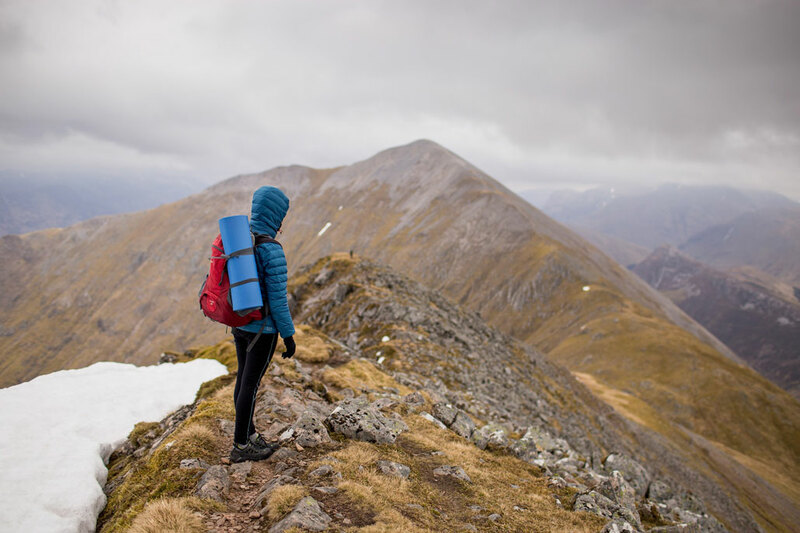 Go on a few proper day hikes and carry your backpack before you commit to longer adventures. 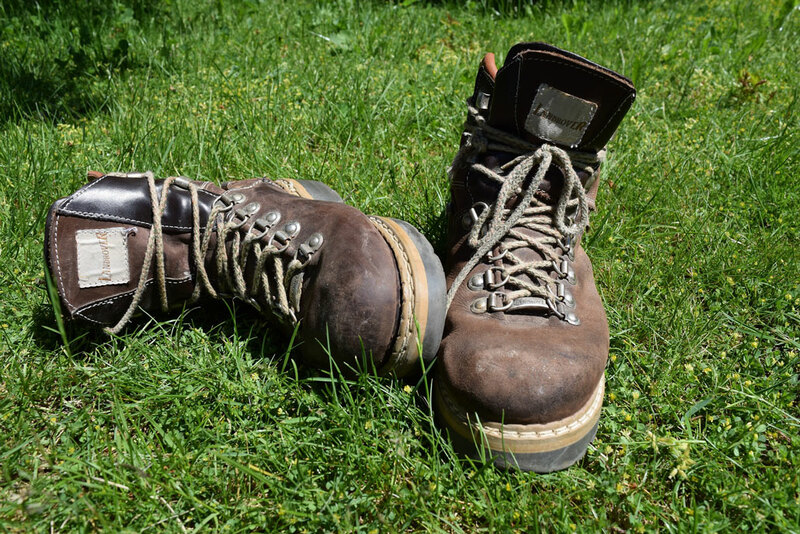 Wear sturdy boots when you carry a heavy pack, or if you’ll be walking on rough terrain. Boots are generally more durable and offer ankle protection. Don’t assume your normal shoe size is the right one. Fit your purchase with thick socks and make sure your toes do not touch the front when walking down-hill. Hiking boots often have a waterproof lining which is very useful for shallow stream crossings or light rain. In heavy rain this will only be of use with rain-proof pants and gaiters to keep water from running down your legs into the shoe. Good socks are as important as good shoes! Many blisters have resulted from using socks that are not fit for purpose. Buy specialist hiking socks made from wool or a wool blend. To avoid blisters, add thin liner-socks. Also use anti-chafe cream on hot spots. As much as I love cotton it just does not work well when things get sweaty or wet. Go for function over aesthetic. There’s a myriad of wicking polyester/blended fabric shirts on the market that can be used at the gym and in the outdoors. Take your pick. Recently, lightweight merino wool shirts have been coming to market as well – works wonderfully but is quite expensive. Hiking pants tend to be more specifically designed for outdoor use, made from abrasion resistant material with roomy legs and zip/velcro closure pockets. Trousers with zip-off legs are a nifty 2-in-1 weight saver. A life saver. 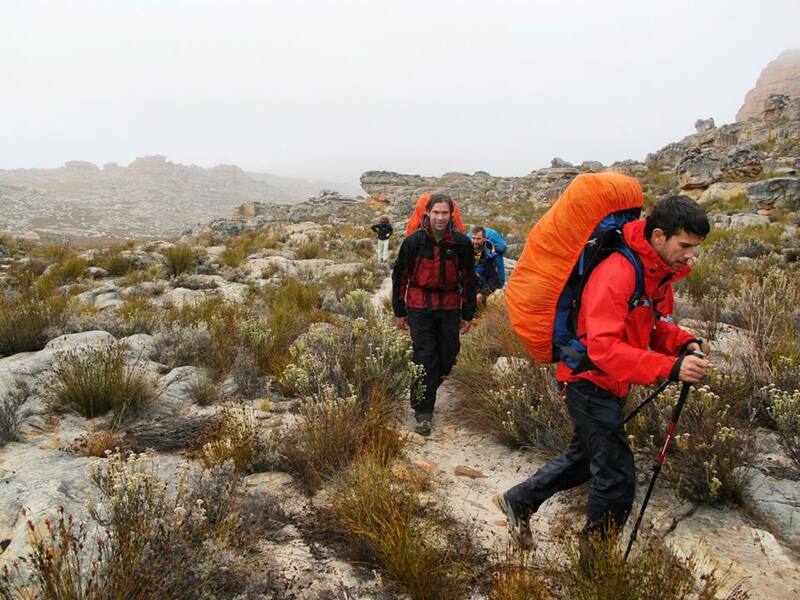 It doesn’t matter if you’re hiking the Fish River Canyon or the Cederberg in summer: always pack a rain-proof jacket. The wind and waterproofness is your first layer of defence against inclement weather, and will help you retain body heat during the coldest desert night. In 2009 three experienced hikers perished in the Swartberg after getting trapped in a freezing storm without sufficient rain-proof gear. Don’t take any chances! A poncho will work just fine in most instances, but has limited efficacy in severe weather. Wind and droplets can blow in from below and if you have to negotiate tricky terrain a flapping garment is not ideal. A quality rain-jacket will be seam-sealed and have velcro closures/drawstrings to tighten it around your waist, wrists and hoodie. Be sure to buy a jacket that is both waterproof and breathable – you will get soaked from your own sweat if the material does not breathe. The secret is in layering. Spending long days and nights outside will take you through a range of temperatures which can be best dealt with by adding/removing layers. Thermal underwear makes a great base layer for very cold conditions. A lightweight fleece-jacket or jersey for mid-layer. For an outer layer, nothing beats a down-jacket. Lightweight, compressible and giving a wide “comfort range” of temperatures. There are also some quality synthetic insulation jackets with the main advantages of being affordable and machine washable. A thick fleece jacket is also effective but will weigh more. A lot of heat escapes through your head – a beanie (in winter) or buff (in summer) should be part of your standard garb. Add insulated/fleece gloves on cold hikes. Top tip: Down jacket for the win! It can also double as a pillow. Preferably a wide-brim hiking hat made from lightweight, quick-drying and high SPF material. A chin strap is useful to keep your hat from flying off when the wind picks up. UV-protective sunglasses, especially in the high mountains where glare and winds are worse. Long sleeve collared shirts made from high SPF material in extreme-UV environments. 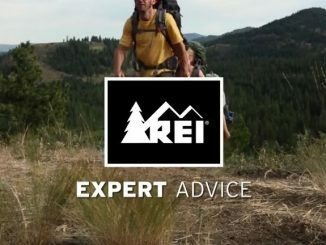 Most outdoor brands make some garments with a SPF 50 rating. The merino wool base layer tights short and long sleeve Ts are worth every cent…ok … Rands! No smell after four day hike!thin yet warm. Buy from CORE merino…. they deliver quickly…. in Stbosc within a day! Thanks for the tip re CORE merino! What a great article! 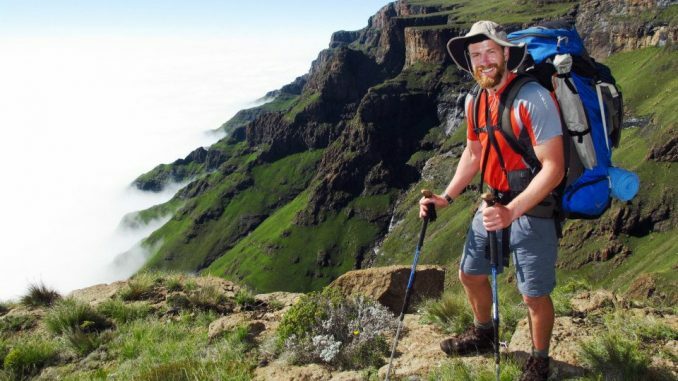 I’ll never forget going on my first multiday hike: it was a real pain finding a complete kit of South African-centric information online, specifically aimed at the hiker’s definitive packing list. Good work and well done on filling the niche!